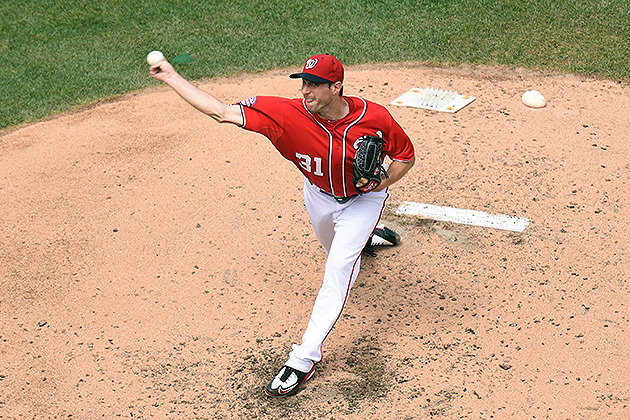 Washington Nationals ace Max Scherzer wears number 31 on his uniform. This year that also happens to be his age. For Scherzer, though, the number isn't what matters, thanks to an extreme dedication to strength and conditioning. Scherzer, a 6' 3", 215-lb righthander, crushes the weight room during the offseason and keeps up the lifting while juggling a physically demanding in-season schedule. His complex strength-training program combines a solid, evenly spread combination of upper- and lower-body training, mixed with cardiovascular work. It is clearly a recipe for success. The St. Louis-born Scherzer made his big-league debut with the Diamondbacks in 2008, after being drafted in the first round by Arizona. Traded to the Tigers in 2010, he went on to win the 2013 AL Cy Young before coming to the Nationals this season. A three-time All-Star and two-time AL wins leader, Scherzer recently provided SI.com with a look inside his health and fitness regimen, and its contribution to his achievements on the mound. 31 years old 6-foot-3 215 lbs. Tuesday—heavy upper body: Dumbbell bench, dumbbell rows, lat pull downs, scapula work, shoulder circuit, biceps, triceps, forearms and abdominals. Thursday—lower body: Lunge circuit, step-ups, hamstring curls and explosive movements. Friday—upper body: Pushups, double arm row machine, one to two additional back exercises, shoulder circuit, biceps, triceps, forearms and abdominals. ​Details of typical in-season workout: Day 1—heavy legs: Squats and power lifts; 30-plus-minute run. Day 2—bullpen/upper body: Chest, back, lats, shoulders, biceps, triceps and forearms. Day 3—light lower body: Lunges, step-ups, explosive movements, abdominal and core circuit; distance running mixed with sprints.